This story about farm animals is different from most of the others, not only because it has a happy ending, but whereas most stories about the plight of the farm animals are written by people, this story was written by the animals themselves. We’ve often admired the excellent work done by Farm Sanctuary in New York and its founder Gene Baur. However, we wondered what the animals thought about being saved from the slaughterhouse and taken to live at Farm Sanctuary. Thank you to the kind hearts and hands that brought me to my new home. Hilda the sheep teaches that all the animals want are the simple things in life, and how much good can be done by kind hearts and hands. 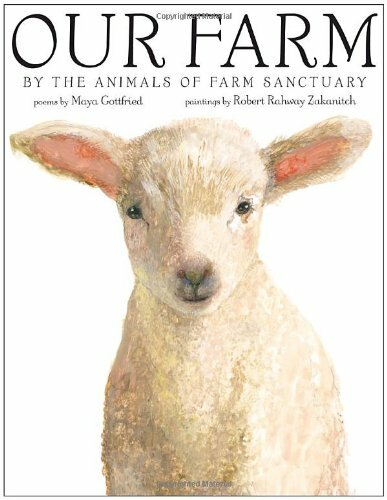 Our Farm, beautifully illustrated, is gentle and sensitive enough to teach children about farm animals and insightful enough for adults to gain a new and deeper appreciation for all the lives a vegetarian diet will save. For those adults who would like to learn more about the harsh realities facing farm animals in the slaughterhouses that a vegetarian diet would prevent, see out of sight slaughter and for the realities facing the workers, see forgotten casualties.